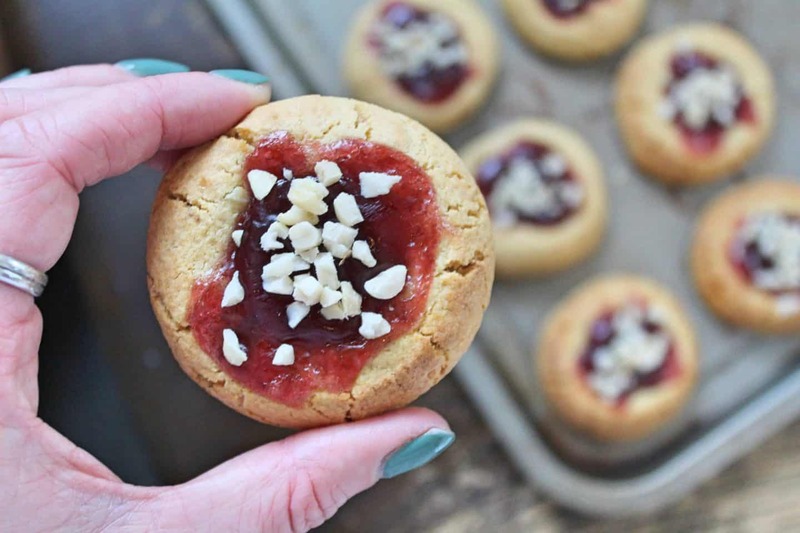 If there’s one thing which screams comfort food, it’s these gluten free peanut butter and jelly cookies. 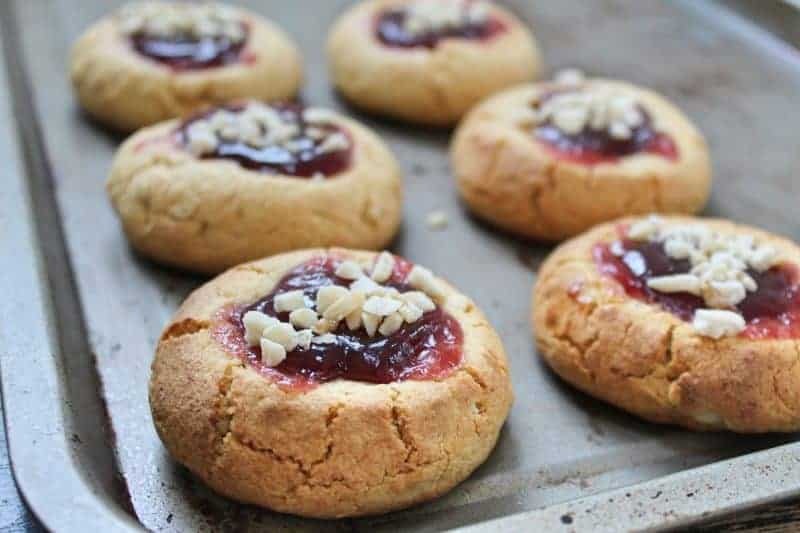 The crunchy peanut cookie filled with a well of raspberry jam (or jelly for y’all Americans out there) is just the perfect combination. I’d been wanting to have a go at creating my own recipe for these and I am so glad I did – and so pleased with how they turned out. Want to get straight to it? Skip to the recipe. 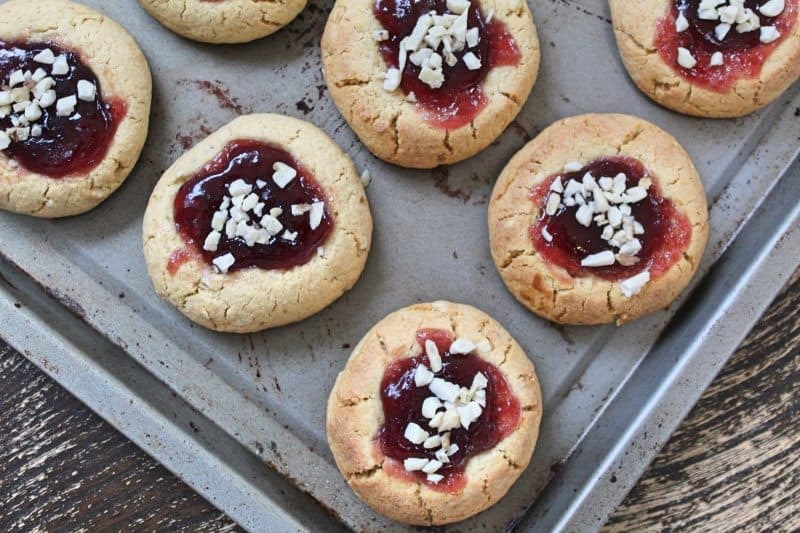 These gluten free peanut butter and jelly cookies are actually SO easy to make. The dough is really pliable and doesn’t spread much in the oven, which is great. I’ve had many occasions where I’ve experimented with cookies and they just morph into one giant mess. I’ve had some successes (see my gluten free Mini Egg cookies or my Eton Mess cookies) but these are a little less chewy, and a little more deliciously crunchy and peanut butter-y. Heaven. You can use any kind of peanut butter in the cookie dough, but I prefer a crunchy peanut butter. Most are gluten free and I tend to opt for a palm oil free version, partly for environmental reasons and partly because you simply don’t need that many added extras in a peanut butter! I have to resist just sitting there eating it from the jar, but it’s worth it to make these cookies! I used a raspberry jam (jelly!) for the centre but if you prefer you could use strawberry. In fact, you could use any flavour, but raspberry is my favourite and my go-to! Just be aware the jam might spread a little when hot, so try not to use one which is too runny to start with. 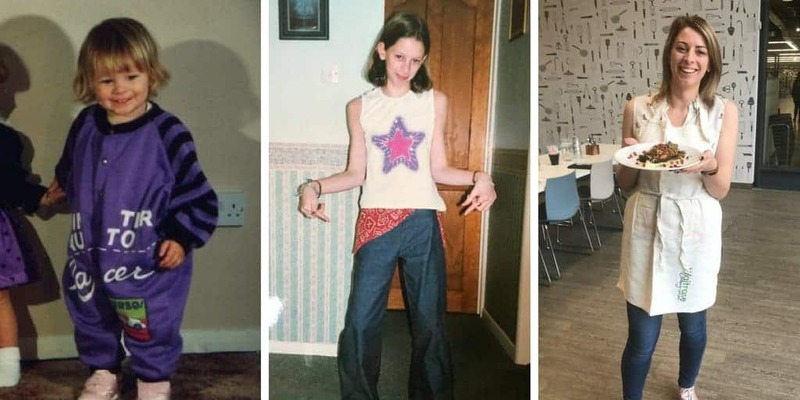 So what other top tips can I give you for these beauties? For starters, you want to make sure you have unsalted butter, and soft brown sugar, as these will ensure you get the best flavours. If you want to make these dairy free you can use the hard Stork which I believe is dairy free, or another dairy free butter alternative. I’ve not tried them with an egg replacer to make them vegan, but if you give it a go, let me know what they’re like! 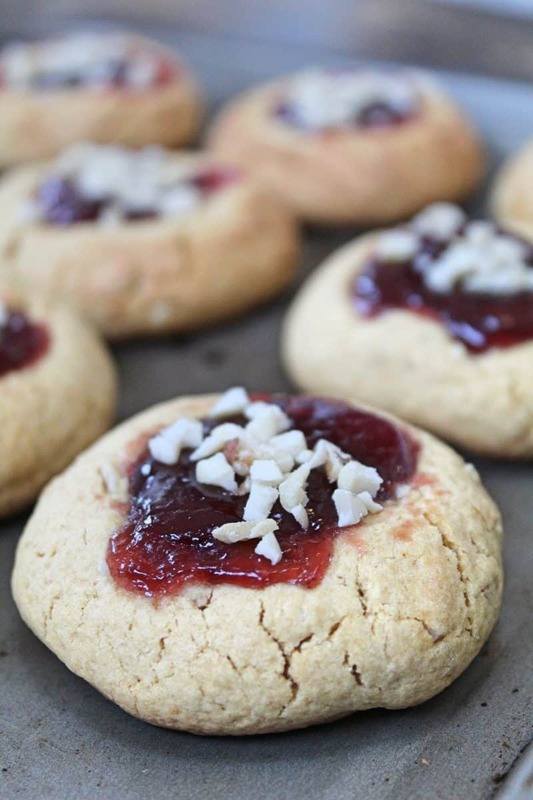 These gluten free peanut butter and jelly cookies and are super tasty and look beautiful. The perfect pairing of crunchy peanut butter and raspberry jam. Preheat the oven to 180'C. Line two baking trays with baking paper and set aside. Add the butter, sugar and peanut butter to a large mixing bowl and beat together until light and fluffy. Add the egg and beat together until combined. Add the gluten free flour and chopped nuts and mix together with a wooden spoon. You might need to use your hands as the dough firms to bring the dough together. Divide the dough into 10 balls (approx 50g each) and place 5 balls on each tray, with space for them to spread a little during cooking (they won't spread much!). Using your thumb, make a well in the middle of each ball of dough and fill each one with 1 tsp jam. Bake the cookies in the oven for around 10-12 minutes until starting to go firm and golden. Remove from the oven and cool before eating. If you like, sprinkle the jam with a little extra chopped nuts before it cools. Need some more gluten free recipe inspiration? If you’ve got the gluten free baking vibe and you want to try some other recipes, here are a few to get you going! If you do make this recipe please let me know! I’d love to see your photos using #theglutenfreeblogger, share them in my Facebook group or tag me on Instagram. If you have any recipe suggestions, please let me know in the comments what you’d like to see next! 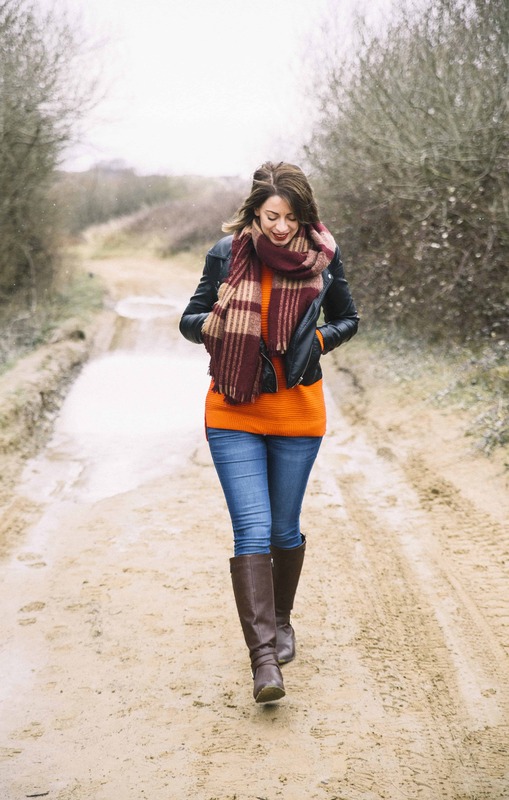 Oh – and don’t forget to sign up for my e-newsletter where you’ll know about all my latest posts and finds! Like this recipe? Make sure you pin this recipe card below for later! Gluten free balsamic caramelised onion houmous recipe – perfect for dipping or topping! Next Post My gluten free Ikea meatballs recipe – like the real thing, but better!